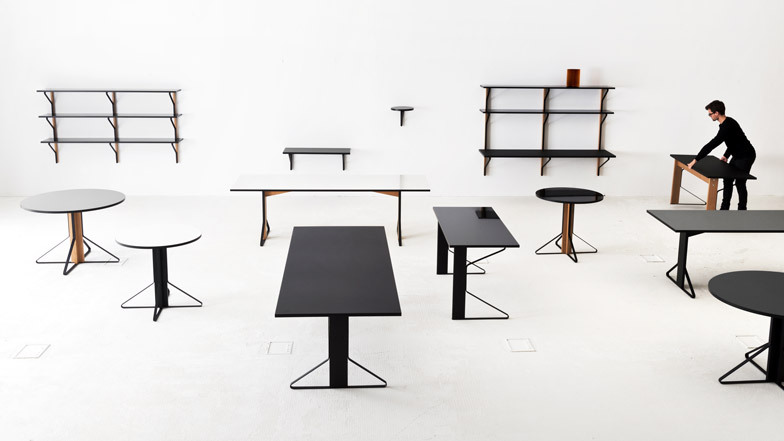 Stockholm 2015: French design duo Ronan and Erwan Bouroullec have made a bent steel component the basis of a collection of tables and shelving for Finnish brand Artek. The Bouroullecs' Kaari Collection for Artek comprises rectangular and round tables in two sizes as well as a desk, a wall console, a small round shelf and larger shelves. The table was the starting point for the designers, who noted that the typology has only undergone minor alterations over the past 100 years. "While there have been hundreds of memorable chairs, only a few tables have made design history," said Ronan and Erwan Bouroullec in a statement. "Since the middle of the previous century, the materials that have proven suitable for tables have changed very little." The designers created a supporting element from a simple section of metal, bent to form a triangular shape that gives the collection its name – Kaari, meaning "arch" in Finnish. This element provides a foot for wooden table legs of a variety of heights and also acts as a simple bracket for shelves when turned upside down. "Soon it became evident that the same system could also be used to construct wall-mounted objects such as single shelves on brackets and entire shelf units," said the duo. In each case, the steel pieces provide diagonal support for the vertical and horizontal wooden planes. "Both wood and steel banding are traditional materials and a fundamental part of the Artek heritage – however, they have never before been combined in this way." Surface materials for the table tops and shelves include matt linoleum and glossy high-pressure laminate. "As the tables are used over the course of time, these materials will develop an attractive patina," the designers said. Artek was co-founded in 1935 by Finnish Modernist architect Alvar Aalto, who also used modular components such as the bent wood L-leg to support a variety of different furniture pieces released by the company. The factory where these historic designs were developed was bought by Artek last year, following Swiss company Vitra's acquisition of the brand in 2013. The Bouroullecs' collection is presented at this year's Stockholm Furniture Fair, which opens today and continues until 7 February. Artek also recently launched a revived range of wooden furniture and homeware designed by Aalto.